If your children are anything like mine, then you’re usually asked often to tell them a story! Now, sometimes I just can’t think of one offhand, and my brain is too tired to make one up…that’s when this app really comes into action 🙂 And the best part is, it has values too! 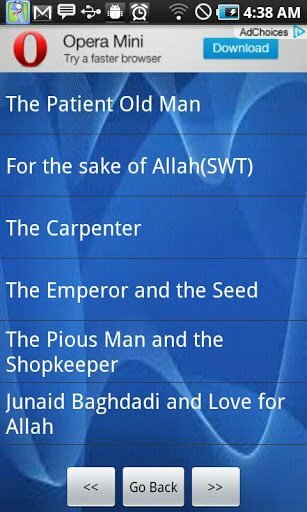 There are Islamic stories (from history and recent times) and stories for kids (not necessarily Islamic but has some of the well-known ones like The Hare and the Tortoise), as well as some jokes, although I would vet these! Just a note to keep an eye on the content, although on the whole it seems neutral. Overall? A useful and enjoyable app to have, especially when you’re snowed in somewhere and have time to wile away!